Can Nike+ Training actually improve physical fitness and athletic performance? I laced up my sneakers, moved my coffee table out of the living room, and set out for answers. It certainly sounds next level, but can Nike+ Training actually improve physical fitness and athletic performance? I laced up my sneakers, moved my coffee table out of the living room, and set out for answers. The Nike+ Training experience starts with the shoe, the Nike LunarTR1+ (women have the option of choosing the sleek Lunar Hyperworkout), and includes a “Sport Pack” with all of the necessary parts to enable the Nike+ digital experience (two Sport Sensors, a Sport Charger and Sport Adapter for pre-4S iPhones). The setup process is relatively quick and easy: After downloading Nike+ Training from the App Store, I placed the now-charged Sport Sensors into slots in the footbed of each shoe and synced them with my iPhone. The Nike+ Training app then (and before each workout) prompts users to lift each foot and confirm the shoes are synced with a visual representation on the screen. The instant feedback of the pressure sensors and the accompanying visual is quite fascinating, showing off the power of both the new Nike+ technology and the wireless data transfer capabilities of Bluetooth 4.0. Once synced, Nike+ Training threw me right into Allyson Felix's Fast Feet Drill, prompting me to shuffle in place as fast as possible, creating a torrent of loud squeaks and thuds that most likely scared the hell out of my neighbors. Nike+ Training, like its relatives in the Nike+ ecosystem, works by recording quantitative statistics based on physical performance and then presenting them in a practical, usable fashion. For Nike+ Training, Sport Sensor-equipped shoes measure pressure at four different points in the footbed, using the feedback to record repetitions performed during various workouts – every raise of the heel, skip, jump and shuffle. Even upper body exercises, such as push-ups, are recorded by executing a simple toe tap at the top of each rep.
Repetitions help establish a Nike Fuel point total, the same metric debuted by the FuelBand. While Fuel points do not come as easily using Nike+ Training (20 push-ups might equate to, say, walking two blocks wearing the FuelBand), they do serve as a way to quantify how much total training is accomplished in each workout, per day and week. The iPhone serves as a scoreboard for these statistics, instantly updating totals to let users know how close they are performing in real time. This is key for the many timed interval exercises used in Nike+ Training, motivating users to set records and achieve high scores. 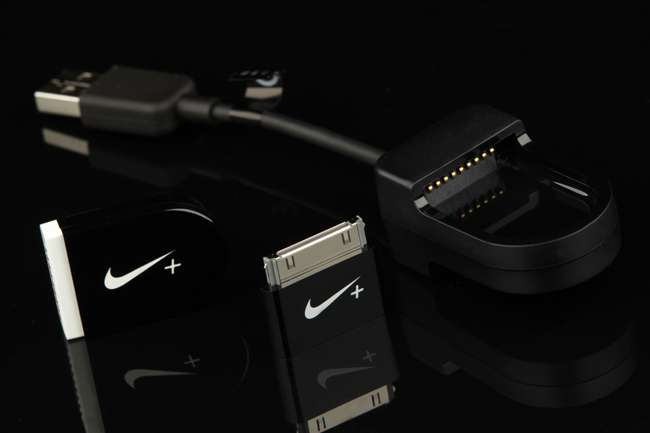 Like the FuelBand, this creates a game-like environment that sets the Nike+ Training experience apart from nearly everything else on the market. 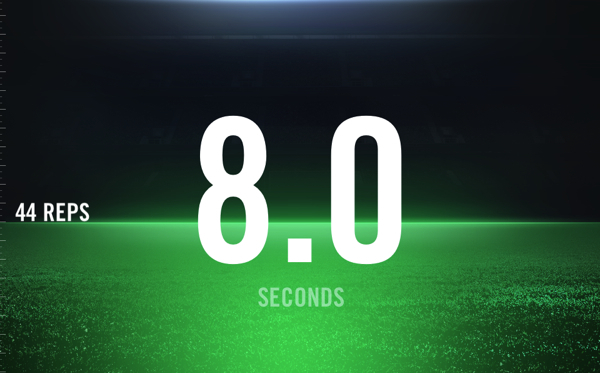 The Nike+ Training app coaches users through a series of individual exercises, including lunges, squats, mountain climbers, push-ups and the ominous-sounding “push-up frogger.” These exercises are grouped into 9- to 13-minute drill packs promoting athletic attributes such as explosiveness, strength, power and endurance. Each drill pack is headlined by a Nike athlete, including “Rise Up” with LeBron James, “Power Punch” with Manny Pacquiao, “Tone Setter” with Hope Solo, “Fast Lane” with Allyson Felix, “Final Set” with Rafael Nadal, “Race Shape” with Perri Shakes-Drayton, “Break Away” with Chicharito Hernández, “Love Game” with Li Na, “Grind It Out” with Larry Fitzgerald and “Perfect 10” with Shawn Johnson. While not drastically different from each other in terms of the exercises used, the drill packs are all effective in their own way, using slightly varied, high-intensity interval training circuits for a full-body workout. (With the video game model in mind, the structure of these drill packs also seems like an excellent opportunity for future downloadable content). The personal training aspect of Nike+ Training truly comes into play with the “program” setting, which puts users on a semi-structured, four-week exercise schedule. Users pick an ability level (beginner, intermediate, advanced) to determine the quantity of workouts per week (for example, intermediate equals four out of seven days). Reinforced by daily messages coming from the iPhone's notification center, Nike+ Training's program mode kept me motivated and on track. 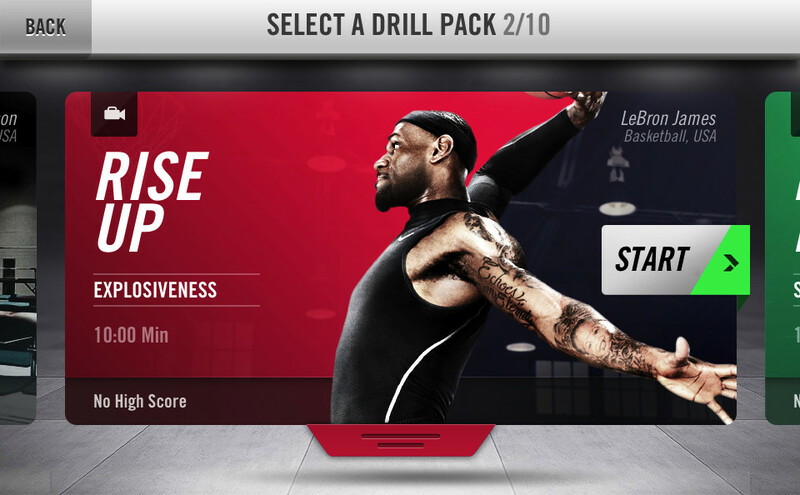 Amid the structured elements of Nike+ Training, the app also contains a freeform “live mode” which records vertical jump height and quickness (steps/second), the two key measurements from the Nike+ Basketball experience. This was especially nice to see, because although they might not factor into the Nike+ Training fitness program, vertical jump height and quickness are two measurements that are still extremely useful (and entertaining) outside of basketball. After my scheduled workouts were finished, I would often turn on live mode and check my vertical (bruising my ego in the process). Competition is a key element in Nike+ Training, motivating users by comparing their scores to previous personal bests, and even the scores of others around the globe. One of the most effective tools inside of Nike+ Training occurs in program mode, where most workout days end with a special challenge. For each of these challenges, stars are given out based on performance, with top scores earning three stars (think Angry Birds). Take, for instance, LeBron James' Agility Shuffle Challenge: on my first try, I missed a three-star rating by four tenths of a second. I was ticked off. I needed those three stars. Suddenly it was like beating a level in a video game, but with a little more sweat and a lot less Mountain Dew. I took two more stabs at it before finally reaching my goal, improving my time by 1.4 seconds. For users that want to compete on a larger scale, workout statistics can be shared online via Facebook and on the Nike+ network. Top athletes can compete for a top spot on global leaderboards, while others might want to just beat the scores of their friends. At the very least, displaying the results of each workout online for the digital world to see will keep Nike+ Training users honest. After spending one month with Nike+ Training, I can honestly say that I am in better shape than when I started. Where the FuelBand serves as a reminder to stay active, Nike+ Training kicks things up a notch, motivating users to, as my old baseball coach used to say, “get after it.” You can't attach this to a ceiling fan. That is not to say everything is flawless. One of my initial skepticisms about Nike+ Training, and a common gripe among consumers, is the perceived high price. At $235 for the LunarTR1 Sport Pack, I cannot blame people who hesitate to buy in. With that said, however, if you want to get in better shape, or just add something different to your existing workout, Nike+ Training is worth it. As a fitness aid, the extra $110 for the Sport Pack compares favorably to most monthly gym and personal training fees. Nike+ Training is also efficient, as I was able to perform every exercise within the confines of a 100-square-foot living room. Like the FuelBand, the reason I want to keep using Nike+ Training is because it feels like a game. This is extremely important, because it takes something that I have to do and makes it something I want to do, and that is worth a lot of money. With new products including the Nike+ FuelBand, Nike+ Running, Nike+ Basketball and Nike+ Training, Nike is embarking on a future that is not just about products, but also about experiences. In the case of Nike+ Training, consumers get not only a sneaker, but also an experience that just might help them become a better athlete.